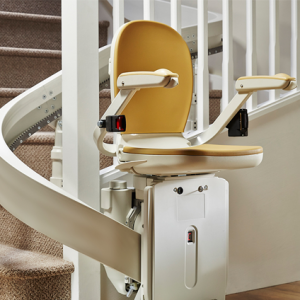 Stairlifts offer a wonderful way to become safe and independent in your home. Ideal for the elderly, disabled and fall-prone persons, they are a great way to lift someone up and down the stairs. Mobility Direct North brings to you an exclusive range of stairlifts that are crafted to help you become independent in your home. Easy to use, reliable and safe, our stairlifts ensure that you can go up and down the stairs in your home easily. If you’re in need of stairlifts in Newcastle or the North East, browse through our collection of stairlifts to find the one that suits your requirements. Simply fill out our contact form to request an obligation free home demonstration.